On a whim recently, I broke down and got a mini version of Jean-Paul Gaultier's perfume Fragile (1999). I had no idea what kind of perfume was inside, and I didn't care: the bottle is in the shape of a snow globe that encases a tiny woman in a black evening gown, her arms akimbo, surrounded by glittery confetti. I've come across many a "figural" perfume bottle while trawling the Internet for vintage perfume. Whether they're Avon owls or Lucien Lelong castles whose columns are individual perfumes, there's something both silly and wonderful about these perfume presentations. They don't take themselves too seriously and they get their audience inducted visually — before they've even smelled the scent — into the perfume's fantasy world. Lucien Lelong again, this time, for Tailspin.The perfume is housed in (why not?) a plastic case shaped as a stack of poker chips. I've seen children's play sets that seem better constructed than this perfume castle from Lucien Lelong, but I give its creators points for trying. 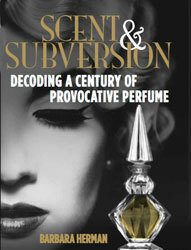 Shock value often comes in the form of perfume names and brands, nowadays.Take the perfume brand, Juliette Has a Gun. Cool name, but all its perfumes have pretty boring bottles. Not boring: Avon Wild Country Cologne in the shape of a Derringer gun. Did you see the handcuff bottle for KONVICT? Hilarious! Wow, Kristy. I'm still waiting to hear that this was a joke from the Onion! O god, I love the guns! My grandmother had that Avon cologne in the gun bottle: she gave it to her nephew, and when he'd worn most of it, he gave her the bottle back and she kept it with her "interesting bottle" collection. When she died the collection numbered 61 bottles of all different shapes/sizes/purposes. I hope you inherited that collection, Mals86. And clearly some of her nutty love for perfume rubbed off on you! I'm a bit confused, how does that work? Is it a spray type or something? But its coating protective is so great that it still in good condition till now. I was hoping you could help us with some information. There is a perfume bottle that is for sale and is titled 1924 Lalique Andre Jollivet Jean de Parys Vague d'Or perfume bottle. We put the link below. It is in a auction and we were wondering if you had any information about this piece? The price is already out of our price range but do love it. Any help would be appreciated.